US Cable TV news channel MSNBC began in 1996 as a joint venture between NBC and Microsoft. Over the years to developed an unabashedly liberal bent to its reporting and opinion pieces and is generally seen as a counterpoint to the conservative Fox News network. 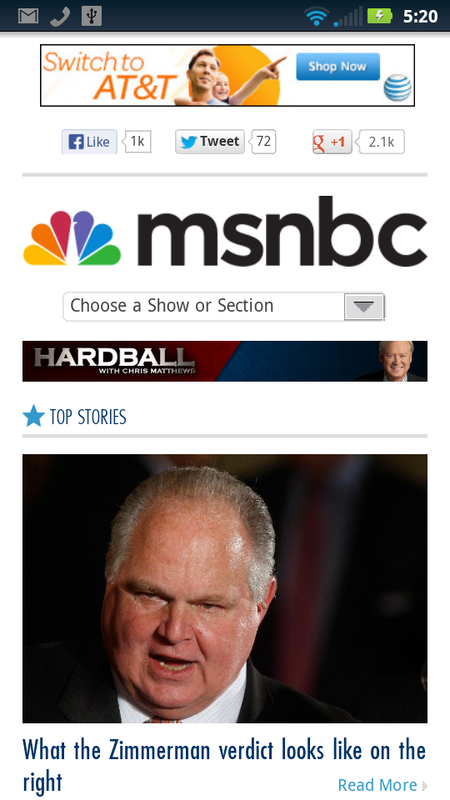 When NBC bought out Microsoft’s share in MSNBC last year the msnbc.com desktop and mobile news sites started redirecting to nbcnews.com. 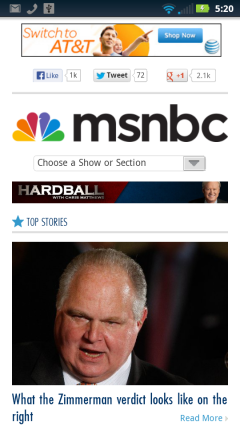 The MSNBC online presence disapeared for several months but eventually resurfaced at tv.msnbc.com with a complete visual overall. 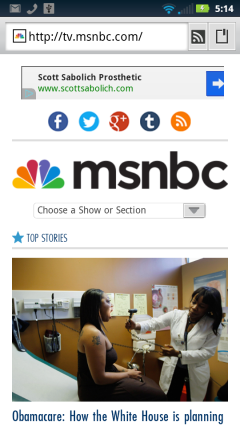 The new MSNBC web properies run on the WordPress.com VIP platform and use browser detection to serve a separate mobile template to phone browsers. The image heavy mobile site works well in the Android and Opera Mini browsers. Content consists of a homepage of current news headlines and separate pages for news categories like education, Health and the economy as well as pages each of MSNBC’s shows. This entry was posted in News Sites and tagged mobile site review by Dennis Bournique. Bookmark the permalink.